I always look forward to watching Ghostbusters on Halloween night. It’s not particularly scary, but it is timeless and very funny indeed. Spoilers – unless if you’ve been living in a cave for more than 30 years! I do love it when the Stay Puft Marshmallow Man turns up towards the end of the movie. After Egon has warned the other Ghostbusters not to think of anything and clear their minds as whatever they think of will come to kill them. Of course cuddly Ray thinks of the huge hulking Stay Puft giant. I’ve often wondered what the marshmallows taste like. Finally Cinabar stumbled across a packet in a local store. Once passed to me I found that there was a heavy vanilla smell on opening the packet. I quickly discovered that once I’d put one creamy sweet vanilla marshmallow in my mouth and felt it melt as I chewed, that it was almost impossible not to put another one in straight away afterwards. They’d got it all wrong in the film. 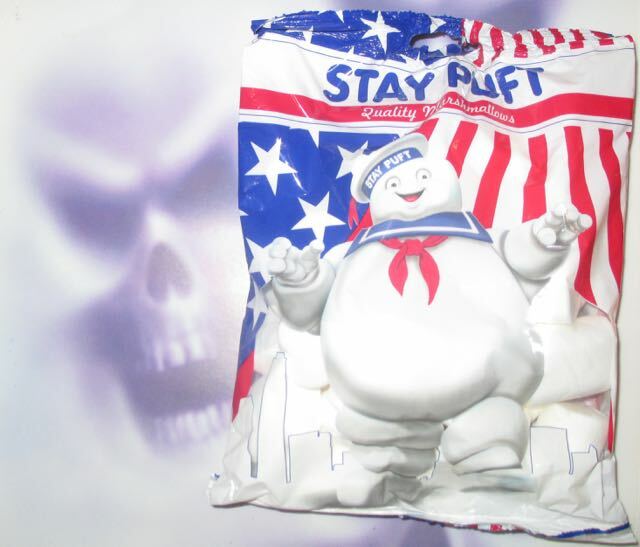 If the beleaguered people of New York had just banded together they could have easily eaten the great big Stay Puft giant, I’m sure of it! I was 9 years old at the time of the movie release, and I’m sure as I would then, I would definitely join in to eat a good marshemellow chunk! 170g packet at 100g there are 341 calories, less than 0.1g of fat, 0.03g of salt and 73g of sugar. Ingredients included; Glucose-Fructose syrup, sugar, water, pork gelatine, corn starch, and flavouring.